Enjoyed in cuisines all over the world, it’s no wonder that avocados seem to be enjoying a renaissance. Its name comes from the Nahuatl word ahuacatl, and was cultivated first by the Aztecs in the region now known as Mexico and South-Central America as far back as 8000 BC. Spanish colonists had a difficult time pronouncing the berry as aguacate, which eventually morphed into the English “avocado.” Avocados are commonly referred to as “butter fruit” in South Asia and South America, where they’re often served with sugar and milk over ice as a refreshing and cool dessert. The most popular avocados in the United States are the Hass variety, sometimes called “alligator pears” for the rough, bumpy skin that covers a smooth, pale green flesh. Avocados require tropical and sub-tropical climates, making California and Florida the two primary sources in the U.S. with the growing season beginning in the spring and continuing through early fall. Though primarily recognized as the main ingredient in guacamole, these buttery-smooth and nutrient-rich fruits are versatile additions to just about any dish, from dips and spreads to burgers and tacos. Avocados are most often used in their raw form, requiring only peeling and dicing without losing the many nutrients during cooking or processing. 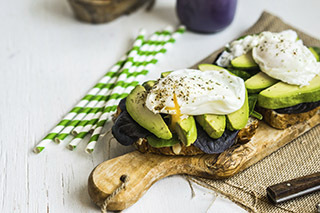 In fact, avocados are considered a “super food” due to their abundance of monounsaturated fatty acids, dietary fiber and minerals like iron, potassium and magnesium. Avocados begin ripening when picked and the green skin will begin to darken to nearly black. It’s best to check the ripeness of the fruit by gently squeezing it in the palm of your hand; a ready-to-eat avocado will be slightly firm, yet yield to gentle pressure. Avoid avocados with soft spots and dark blemishes, as these are indicators of over-ripeness. Ripe avocados should be used within one to two days. Firmer fruit with greener skin is better if you won’t be using them for a few days and they’ll keep for up to a week when stored at room temperature. Once ripe, avocados can be refrigerated for another one to two days. It’s best to cut the fruit immediately before serving to preserve their bright green color. Once the avocado flesh is exposed to air, it begins to discolor and brown. Lime or lemon juice can help slow this process in prepared dishes, but the key is to minimize exposure. Unused halves can be sprinkled with lime or lemon juice, then wrapped tightly with plastic wrap and refrigerated.